'Tis the time of year for wreathes, trees, and cookies. I've already made one massive batch, a recipe test for my office cookie-off, and plan on making at least three more. If it wasn't for those batches, you'd find me at The Bell House at 6pm on Sunday, the 19th, hawking my cookies to the masses. Hopefully, I'll be able to get there to enjoy what would have been the competition. 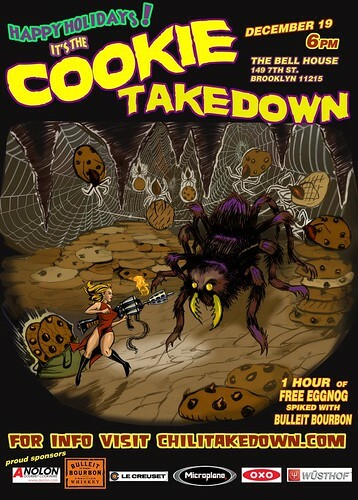 The Bell House is once again the setting for a food competition, this one being the annual Cookie Takedown. There aren't any spots left for cookie makers, but you can eat yourself silly for $15. Plus there'll be free spiked egg nog for the first hour! Last year's winners included a "Salted Brown Butter Pecan Butterscotch Chocolate Chip" cookie, and a Nacho cookie, so you can best bet that it's anyone's game this year. Buy your tickets by clicking here. The Nacho Cookie cannot defend it's title.